Today I am a distraction. We need to take the landing zone so that the traitors cannot bring in even more reinforcements. Three of our APCs are moving up on my right, I'm moving as fast as I can down the middle of the road. 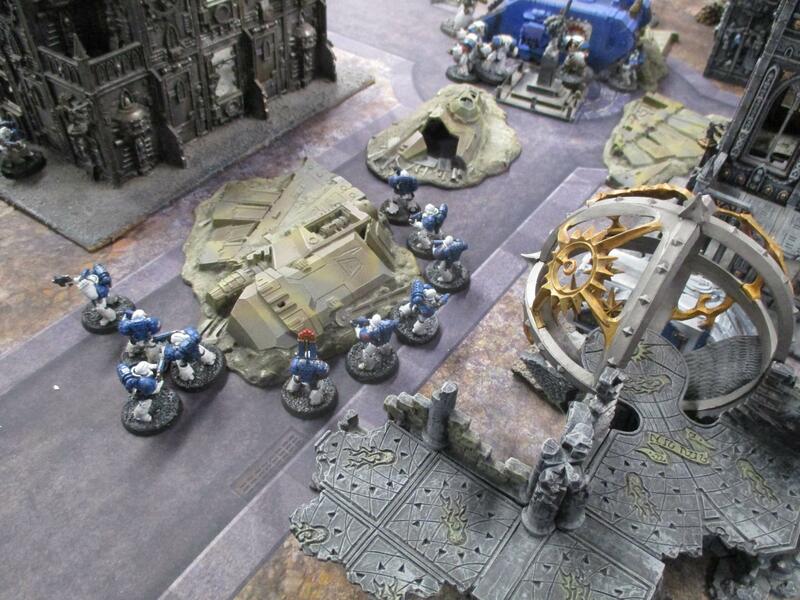 The traitors fire, shells ricochet off of my armour, some explode with enough force to blow even a marine apart. I come on. That's it you bastards, pour it on, keep your attention on me. 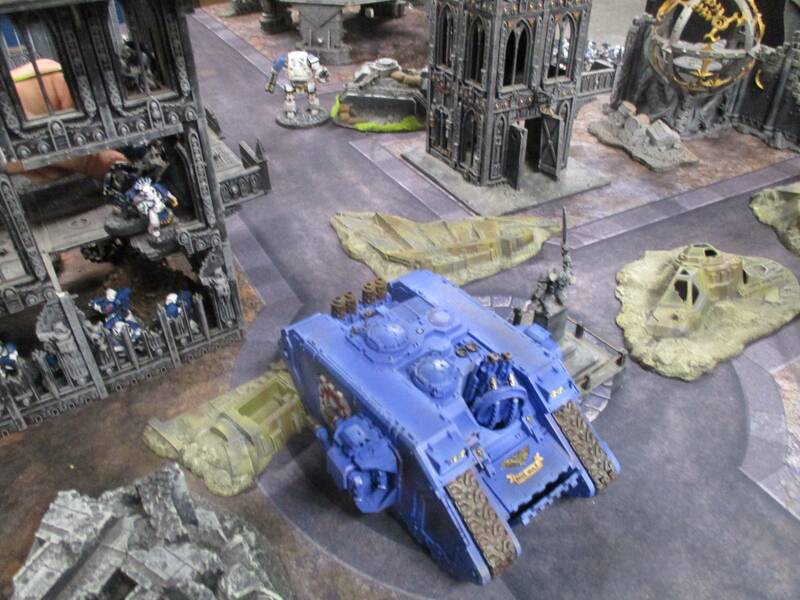 The attack bike streaks up from behind me and fires its multimelta right at the landraider in my path, the intense heat seems to short out the vehicle and the targeting lights dim and the weapons droop. I aim mine at my opposite in the enemy ranks. The shot is a good one and I am rewarded instantly. 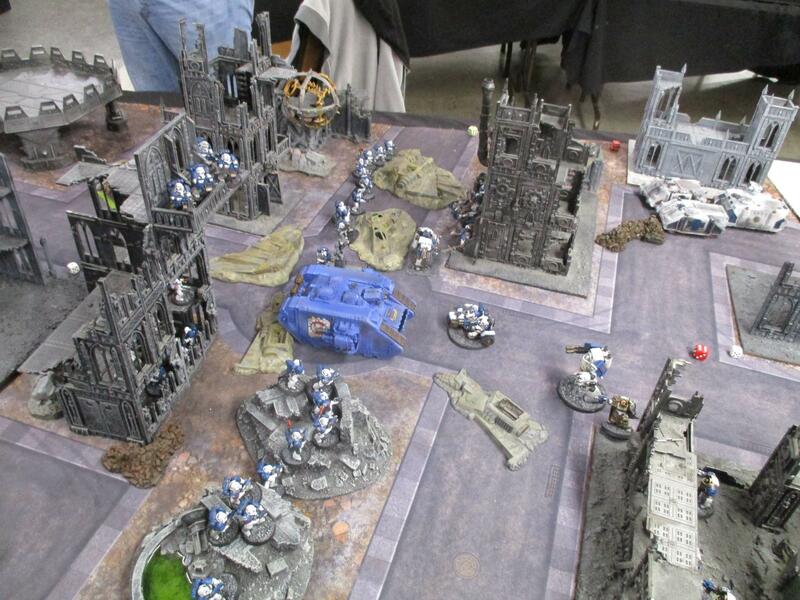 The enemy dreadnought explodes in their ranks, engulfing some of them in the explosion. That should draw them our way. 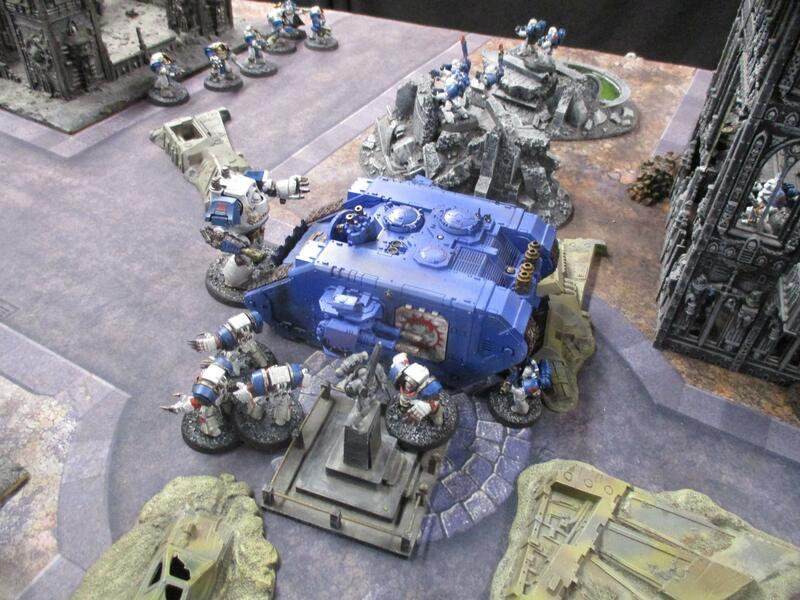 The heavy bolter fire shifts from me to the attack bike and the flaming wreckage flips end-over-end as the massive explosive rounds blow out two of the three tires simultaneously, the two marines in it come to a halt, un-moving their bodies burn. I run past the wreckage and punch my fist into the Land Raiders armoured hull smashing a huge hole in the engine housing. Black smoke pours out of the vehicle and the occupants stumble out. 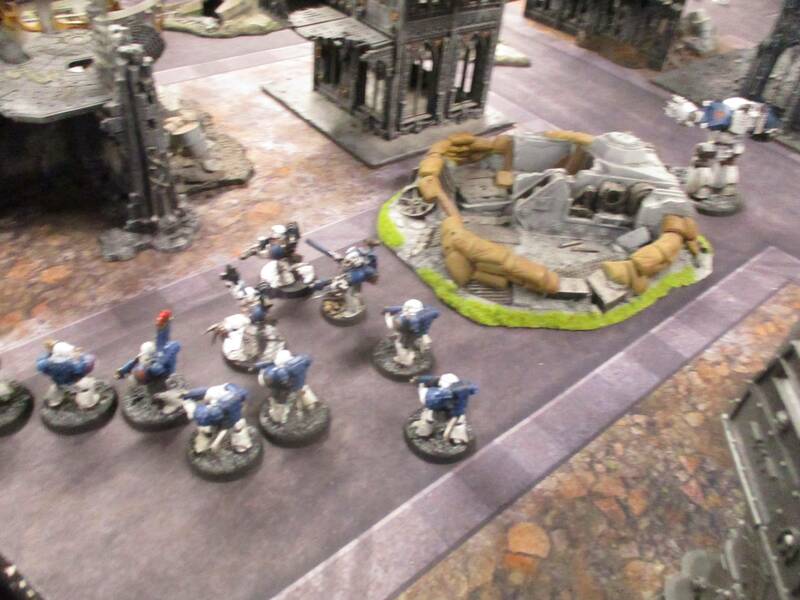 As more bolter fire rattles off of my armour I grab the first one by his arm, crushing it and throwing him into the crater left by the dreadnought I blew up. The others rush me, their lightning claws doing little to my armoured bulk. I smash another one, the impact of my fist knocking him through the wall of a nearby building. On the back swing I meet the lightning claws of another and smash them before breaking the army that wields them. I am dimly aware of fighting on both sides of me. I am failing in my task. The realization of this infuriates me and I smash two more of the traitors into the ground. I see that our feint on the left has crumbled as I grab the last enemy terminator by the head and crush it. I see the enemy is attacking our rhinos on my right. I move past the building the enemy have occupied, firing all of my weaponry into it as I go. The wall collapses a little bit more from my fire. It is answered by desultory bolter fire. I look over to the right and see our squads have made it through the enemy line, have destroyed the enemy line and are at the landing pad. I continue my ranged duel with the enemy in building until they realize they have no weapons heavy enough to do me harm and fall back from the position, leaving us in control of this landing pad. You do make 40K looking very tempting. Agreed. 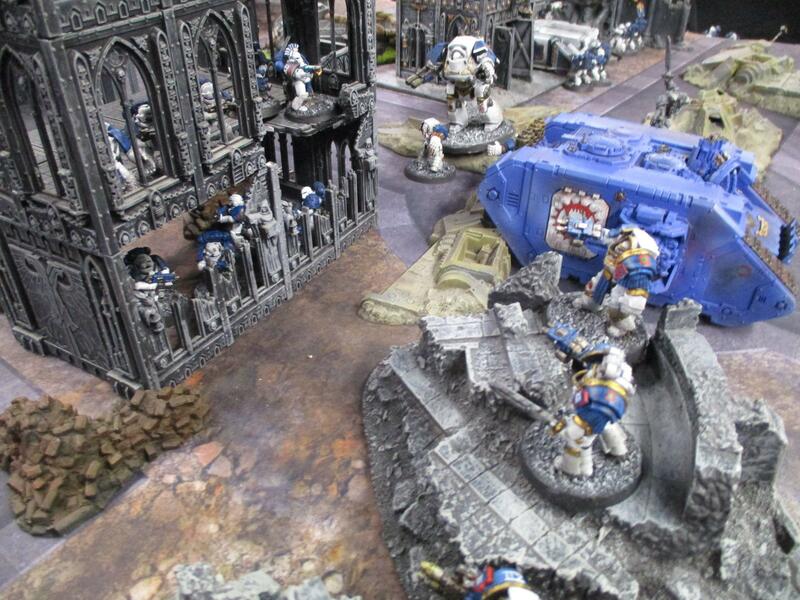 I'd play 40K if I lived near Pictors Studio. Heck yeah! I'm packing up now! Finally…a win for the good guys ! I might be moving to New Jersey soon. The game was the third of the campaign games we played on Wednesday. It was a win for the loyalists which tied the campaign. The traitors won the first game getting 5 Campaign Points. Then the loyalist won the next two getting a total of 5 CPs for both. The campaign has 4 phases of which we played 3 so far. The last game will determine the winner. Indeed…. I love the story crafting of your batreps. And I'd love a game. I'm in the lower end of the Skook, by the berks border. I'll be moving to New Jersey in a few weeks here. I'll probably be heading back and forth on a pretty regular basis. If you have a place to play I'm sure I could bring figs and terrain for a game. I can take 78 back as easily as 80. Loved the way in which you did your AAR and many thanks for the pics. Had the Eldar 'way back'. Only Space Marines and rhino's were plastic. The collection got bigger & heavy, GW's 'buy me' rules didnt help. So I left. But when the SM Terminators & Dreads came out in plastic, I built a very small 'detachment' based around the Dark Angel Death Wing. Havent played in yrs now. I hadn't played in years either. We are still playing 3rd edition now that we are back into it. Now that 8th is coming out, seeing some of the changes, we will certainly give it a try. And Archer, I'm in Jersey now. Hit me up if you want to meet up and play sometime. I live in Raritan, so Allentown is about an hour drive for each of us, I'd guess. If you know of any gaming places there. We have the Only Game In Town here in Somerville if you are up for the drive. I've got plenty of terrain. Recently talked briefly w/ a few guys while they were finishing up a game. Not only did they tell me the rules (wow no idea they were up to 8th version) have been 'simplified' for lack of a better term.. streamlined I guess. But.. I was informed that now apparently you can have an All Dreadnought Army. So I was told. Yeah, it is up to 8th. 7th was a bit of a mess. I think you've been able to have an all dreadnought army for a while. Or close enough. We still use 3rd edition for 30K.